Buddy (David Schlumpf) helps the ensemble of ELF THE MUSICAL make Macy's Department Store more "Sparklejollytwinklejingley." Olney Theatre Center’s production of the Christmas-themed Elf the Musical is a treat for holiday-lovers of all ages. 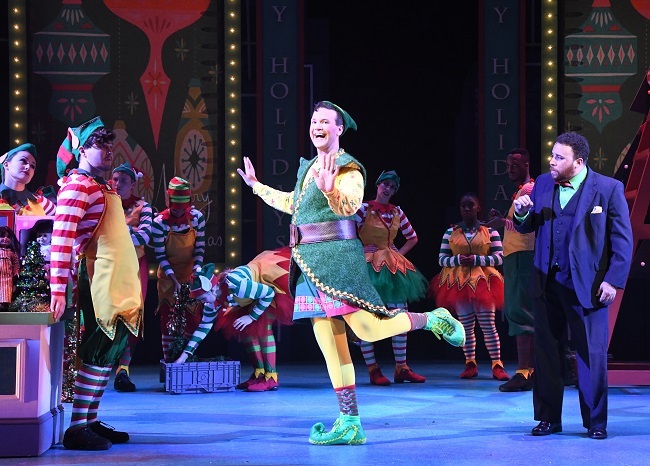 While the story of Elf, a movie originally starring Will Ferrell as Buddy the Elf, is a playful and fun watch, Olney’s production of the musical is made even more magical thanks to creative costuming and set choices. A talented cast ties the whole show together, bringing much-needed Christmas spirit just in time for the holiday season. Anyone who has seen the movie knows that the first portion takes place within the pages of a storybook, complete with talking animals set against a cartoonish backdrop. I was interested to see how they’d accomplish this on stage. Through the use of puppetry, Olney’s puppet team (led by Kylie Clark) designed a talking Narwhal and a dancing penguin. That was all within the first 20 minutes of the show. The puppets are used seamlessly throughout. Santa’s sleigh even receives the puppet treatment in a crafty design allowing Santa to actually fly through the sky. Manning these puppets, as well as Santa’s workshop, is a talented and beautifully costumed set of elves. Through creative choreography by Tara Jeanne Vallee, Santa’s elves are elf-sized and move with ease through an intricate dance-sequence with the help of rolling carts. It’s hard to explain while not spoiling the design surprises. Just know this: Magic carries through to Santa’s workshop. As Buddy leaves the workshop and heads off into New York City, the choreography changes to reflect the bustling city and, in a way, becomes even more creative. Vallee is able to create varied dance sequences in settings such as an office and an ice rink, and with a few out-of-work Santas. The mad-cap sequences provide movement and laughs to the production. The addition of the costumes by Kendra Rai to the choreography brings the world of Santa and New York City to life. From elfen outfits of bright colors, pointy shoes, and lots of fur, to business attire in varying shades of black and pops of purple, Rai brings boldness to all of her designs. Each costume seems to contain a flourish of some sort that ties each outfit together. Rai somehow creates the fun of the movie in a paired down, stage setting, while still allowing for intricate designs and bold choices. Allowing these designs to shine, Director Michael J. Bobbitt assembled a first-rate team of actors, who seem to bring the joy of the show with them on stage, beginning with David Schlumpf as Buddy. Buddy is a well-known and much-loved character. Any actor that tackles him must bring that childlike wonder to stage, as well as a flair for comedy. Schlumpf has all of that and more. His Buddy is earnest and sweet and so very likable. You’re supposed to root for him throughout the piece, but in this case, the audience is completely behind every move he makes. He seems born to play the part. Playing Buddy's newly-acquired family, Bobby Smith, Janine Sunday, and Tyler Quentin Smallwood combine to form a believable family unit. Specifically, Sunday and Smallwood (as mother and son) have such great chemistry in their scenes together that I checked to see if they were mother and son in the real world. Smith, on the other hand, plays a lovable curmudgeon with ease, and you can almost see his heart “growing three sizes” throughout his performance. Additional praise must be made for the fabulously diverse ensemble that adds so much pizazz to the production. When it was time for the curtain call, I assumed a large cast would appear on stage. When only about 15 actors appeared, I was shocked. The cast covers so many roles so well that I assumed it must have contained at least another dozen actors. This is a testament to their portrayal of many different characters, as well as the designers’ work in costuming them all so brilliantly. While Elf, may, in fact, be a show geared towards children, it’s ultimately a story about finding a place in the world and bringing magic to the lives of the people that you love. And if we need anything right now, it’s a little more magic. The work of this cast and crew conveys that magic and joy each and every night, sharing the love with audiences of every shape and size. In short, it’s a pretty great way to celebrate the holidays! Elf the Musical plays at the Olney Theatre Center through January 6, 2019. For tickets, purchase online. The Folger Consort presents a seasonal celebration of early English music, Dec. 14–23. Learn more here!